Gruel Rice or Ganji is usually in liquid consistency and can be prepared out of brown rice and white rice. I have already discussed the Kayihalu Ganji ( coconut milk gruel rice ) which was prepared out of white rice. Brown rice is the unrefined version of white rice. It is highly rich in proteins and other vitamins and minerals. People usually prefer white rice over brown rice since it looks attractive. But in reality, brown rice is the best choice because of its highly nutritional value. It contains lots of fibers and it is recommended by the doctors specially for diabetic people. It has a low glycemic index value and so, a person with diabetes can eat one cup of brown rice daily. Cereals prepared out of brown rice, is one of the best baby food. So, kids may be given this in plenty. Brown rice is used in various dishes and the dish I have prepared is gruel rice made out of brown rice. It is very tasty and slightly sweetish. It is the most simplest dish out there which can be prepared from brown rice. It is a healthy breakfast too! When you are feeling low due to fever, or stomach upset or any other digestive problem you can consume this since, it does not have any side effects. There are different varieties of brown rice. Some varieties are easy to be cooked whereas few others take a lot of time. And taste of the gruel rice too depends on the quality of the rice. It tastes yummier as the quality gets superior. It takes around one hour to prepare this although it is very simple and easy to prepare. The ingredients which I have mentioned below are enough to be served for three people. First and foremost, wash the rice two to three times thoroughly. Take a cooker and add the washed rice along with the water. Close the cooker lid with the cooker - weight and let it boil. After four to five whistles, turn down the flame to a minimum level and let it stay boiling for another twenty minutes or so. Once when the cooker lid is ready to be opened, add the required amount of salt and stir it properly. Now your gruel rice is ready to be served.!!! After boiling the rice, if you feel the starch amount is more, you can remove the excess of starch water. 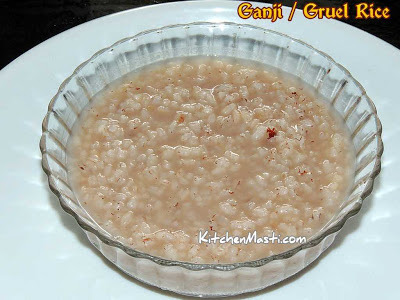 You can eat this gruel rice along with ghee and the pickle of your choice. It tastes the best with this combination. People who eat eggs can have this gruel rice along with boiled eggs or omelets. 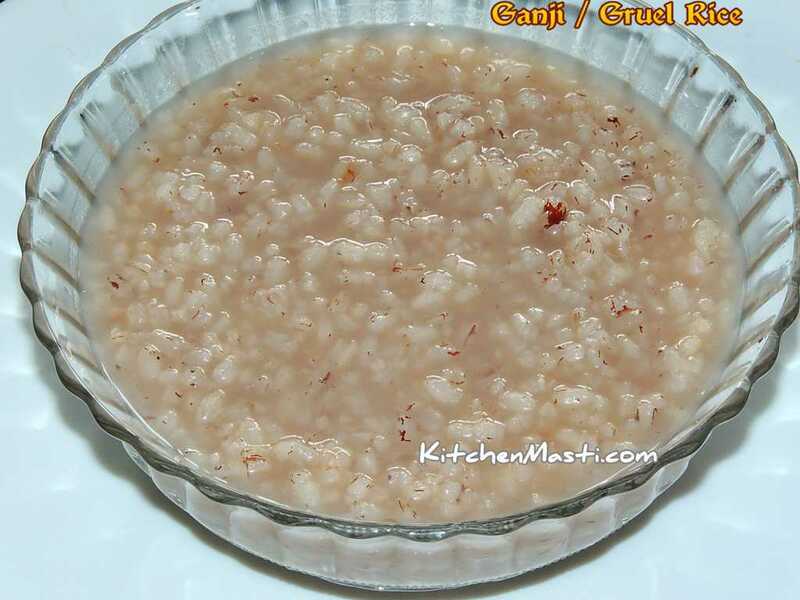 If you are a non vegetarian, then you can consume this gruel rice along with fish or chicken.